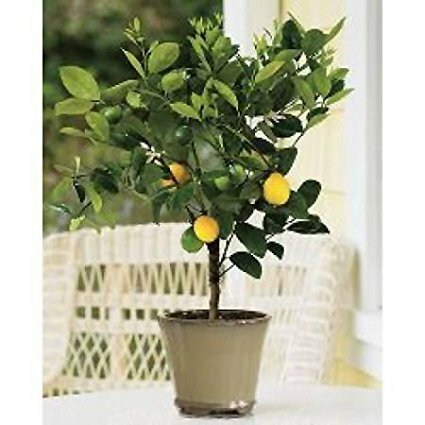 Meyer Lemon Trees from Lemon Citrus Tree are not grown from seed, they are grafted from mature trees onto a dwarf root stock so our trees are of blossoming and fruit bearing age. These Meyer Lemons are hardy enough to grow indoors or out. However when lows drop below 29 degrees Fahrenheit, the tree will need to be moved indoors to a southern facing window so they can continue producing abundantly. As the tree matures further it will bear larger quantities of fruit. Meyer Lemons are green when they are growing, then turn yellow as they ripen and this process can take several months. Meyer Lemons are much sweeter than the standard (grocery store) lemon. They are great for juicing as well as making Lemon Meringue pie. Another benefit is they can recover fairly easily from damage and pests with treatment and are highly adaptable to environmental changes. With the proper care, Meyer Lemon Trees are capable of producing fruit for over 30 years. About 3 feet tall plus the height of the container. Arrives in a Black Grower's Pot & Soil, not shipped bare root. If you have any questions about this product by Lemon Citrus Tree, contact us by completing and submitting the form below. If you are looking for a specif part number, please include it with your message.